Pro Series 50 Inch Tripod - Non slip feet and a bubble level indicator - It has an adjustable center pole and comes with a water resistant carrying case. 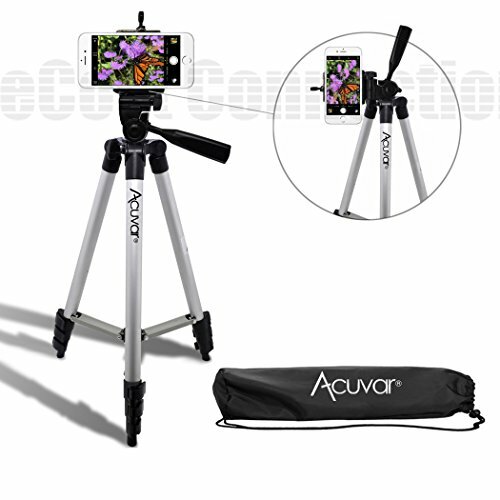 - The tripod is lightweight and mobile with its aluminum alloy legs and a 3-way pan head. 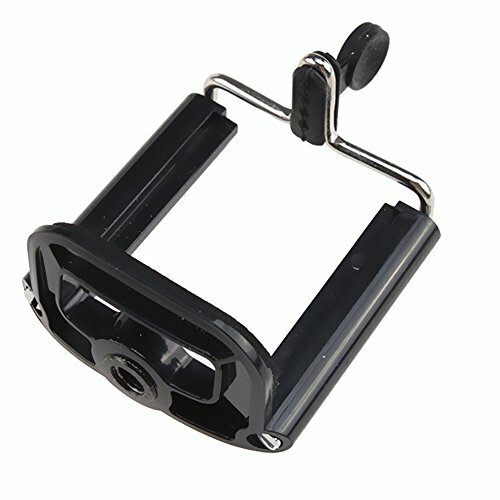 Universal Smartphone mount - Easy attachment - Padded grip to avoid damage to your smartphone - maximum stretch of 3.4” for smartphone Input - Measures: 2.5” x 2” x 1” inches Microfiber Cleaning Cloth - Especially effective when used dry to quickly and easily remove oil and fingerprints with just a swipe. Can also be used with or without cleaning solutions. 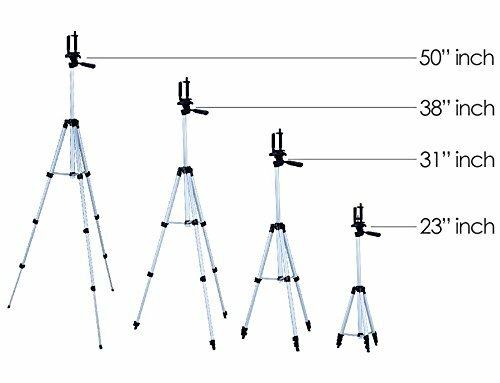 Pro Series 50 Inch Tripod - Non slip feet and a bubble level indicator - It has an adjustable center pole and comes with a water resistant carrying case. 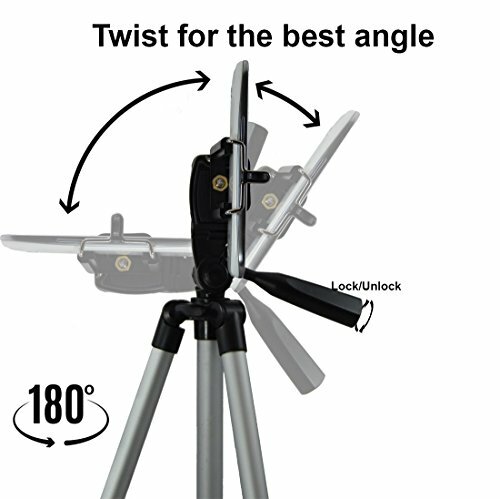 - The tripod is lightweight and mobile with its aluminum alloy legs and a 3-way pan head. 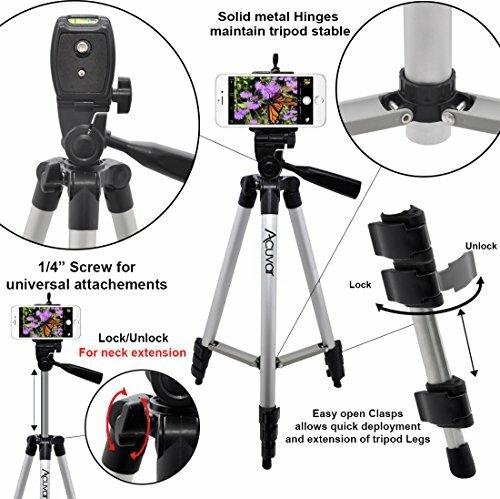 Universal Smartphone mount - Easy attachment - Padded grip to avoid damage to your smartphone - maximum stretch of 3.4" for smartphone Input - Measures: 2.5" x 2" x 1" inches Microfiber Cleaning Cloth - Especially effective when used dry to quickly and easily remove oil and fingerprints with just a swipe. Can also be used with or without cleaning solutions. LOVE THIS SO MUCH! It got to me in 5 days! I would recommend this if you are on a tight budget, but still, this product is FANTASTIC! It works amazingly. Great for its price. It helps me record my makeup videos, since I record on my Iphone6 Plus. I would so totally buy from this seller again. Great service. Very great for the price! Legs are flimsy like the reviews say but it’s not so bad. Doesn’t bother me because I’m using this for YouTube videos at home and not bringing it out. You screw the mount on. 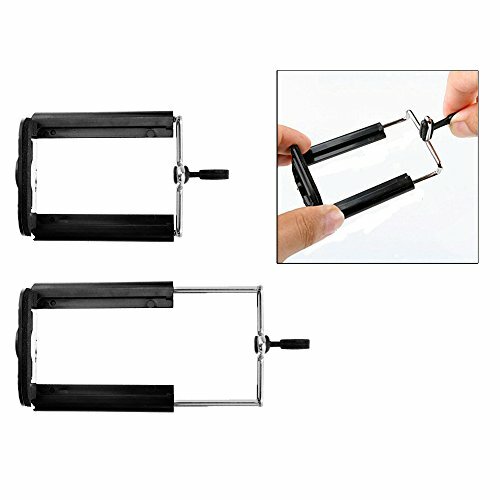 Unclip the clips, pull the legs out and clip it again to the size you want it at. Perfect for me, thank you! 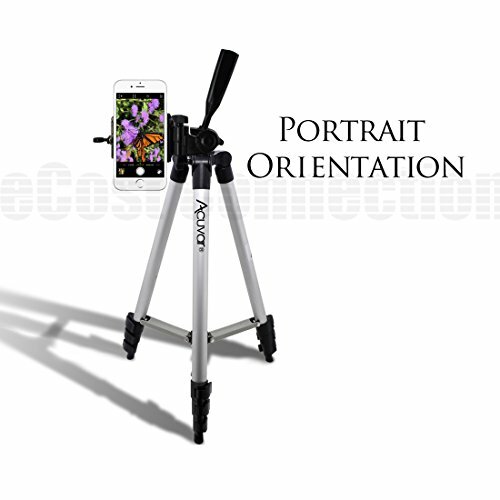 I purchased eCostConnection 50″ Inch Aluminum Camera Tripod (roll credits) to experiment with iPhone photography. And really was excited when it arrived all the way to unpacking and setting it up. Then, I could see the future…and it was ominous!The short answer:In spite of being excited upon receipt/ opening this tripod, it is a bit of a disappointment. While I can’t review what hasn’t happened yet, it is a fairly flimsy product. While I like a lot of the design, I just wish the thing felt sturdier. Overall I liked it and give it a tentative buy.The longer review:Things I liked:The packaging was very good, making me excited to see how good this works! I thought I had found a hidden gem!It comes with a nice little bag to carry it in, and set up was easy.The legs lock fairly tightly, but easily, so it shouldn’t just collapse. There is a ‘stabilizer triad’ (my own word) in the center to keep the legs equidistant from each other; experience tells me this is an important design option.The head has 3 axis of rotation, kind of standard on a tripod, but you know…There is a bubble level for one axis, which is nice!The smart phone mount (read ‘clamp) is better than other but still just OK.The set-screw, while it had a good head on it for turning, believe it or not this is something to comment on, others don’t!You get a microfiber cloth woo-hoo!The price is fair, given the kit you are getting.Things I did not like:They use how light this is as a selling point…pretty smart marketing. But I don’t think it is a plus. I will not be trying it in winds much more than a gentle breeze, as it is so light and the stance so narrow I believe it will be blown over.I have to say it. This thing feels a bit flimsy. I know it will hold up a cell phone, and don’t believe any camera would crush it, but anything much heavier than said phone will make it top heavy. That is concerning!I really don’t like the ‘clamp’ cell phone holders. 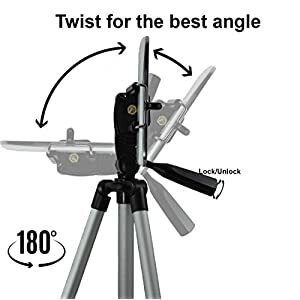 Although comparing others, this seems to be a good one, to use them you have to hold down the tripod while pulling up on the ‘clamp’ and placing the camera, (how many hands do they think I have?) there has to be a better way!Things I hated:There was nothing I ‘hated’ about this product, and even the ‘did not like’ things more than likely apply to similarly priced 50’’ tripods!Restating my conclusion:In spite of being excited upon receipt/opening this tripod, it is a bit of a disappointment. While I can’t review what hasn’t happened yet, it is a fairly flimsy product. While I like a lot of the design, I just wish the thing felt sturdier. Overall I liked it and give it a tentative buy.Note:I find myself buying way too many Amazon products attempting to find things that meet my needs. So I am shooting to become a ‘vine’ member. Please, if you like my review if you find it helpful let Amazon know by clicking ‘yes’ at the bottom. If not, let me know how I can improve! Excellent! It’s very sturdy and even comes in a nice little bag to carry it in. Phone clip works great for my big phone with a case on as well. Highly recommend getting this!